I finally got my act together and put together a story for Friday Fictioneers. I love this prompt, courtesy of Rochelle Wisoff-Fields, who also the lovely hostess of Friday Fictioneers. It also happens to be Rochelle’s birthday. Happy Birthday, Rochelle! I hope you’re enjoying yourself and relaxing. Rochelle’s book Please Say Kaddish For Me was recently published. It’s getting great reviews. Check it out! The challenge is to write a 100-word story based on a photo. Why not give it a try? All are welcome. Lana loves to put on a show. Ivy and Alex put on shows for each other. William, a student, hides behind drawn blinds. Octavia, lost in her own apartment, is on a strict pill diet. Lloyd, the overachiever, wakes before dawn with his stocks and treadmill. Sheamus, this guy never leaves his apartment, never sleeps. He’s always watching; across, below, inside. Conveniently across from his vantage point, a reflective window shines light on their misery. It’s the perfect mix of joie de vivre and desperation. With penthouse views, Lloyd sips his brandy, watching the watched. Misery is calling his name. The mix that makes up an apartment complex. Love it! And apartment living can be complex. Thanks so much, Dale. Who needs television when you’ve got that?… Nice job with this one. It’s a cool pic. Better than TV, too. Thanks, Carrie. It’s a great prompt! Ah yes, the “rear window.” I’m betting this won’t end well, either. Glad you liked it, Tracey. Love this Amy. You never really know what goes on when the front door shuts. Thanks so much, Louise. No, I don’t think we ever really do know what goes on behind closed doors. What a cast of characters. I love the little snippets giving insight into each one’s world. Not too sure about Lloyd, however. There’s something dark going on there. Very clever. Thanks, Margaret. I wanted a good variety of characters. It was hard to know exactly what to say. I think they all have their challenges! You’re right about Lloyd. He’s the dark one in the bunch. Thank you, Margaret. Makes me want to flip open that building like a dolls’ house. Great imaginative take – could be the opening of a novel. Oh, thanks so much! I, too, thought it was more of an introduction of sorts. Glad you liked it. PS I love your mermaid! I feel sorry for Sheamus. Fascinated though, by the concept of watching people through reflections from across the way. How unnoticeable would that be? Great story, Amy. Love it. That would be quite a trick to watch through reflections, wouldn’t it? It’s like hiding in plain sight. Thanks, Sandra. Glad you enjoyed it. 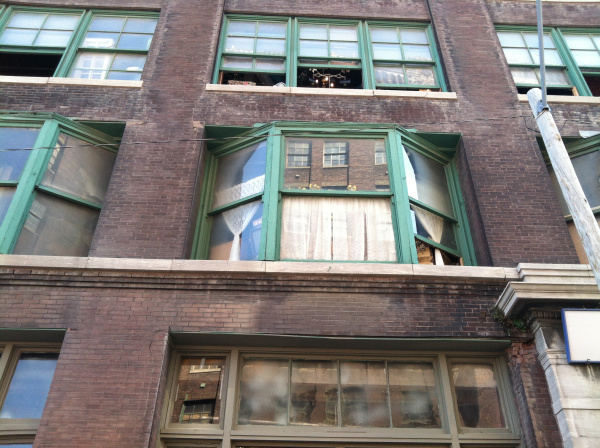 I too had a sense of Rear Window … and of the stories of the variety of people in an apartment. Thanks, Frank. I’ve never seen the movie, although I know of it. I need a Alfred Hitchcock marathon weekend! I loved “watching the watched.” This made me think of the movie Ship of Fools. Well done with vivid characters. Thanks! I had a few other ideas before settling on this one. Glad you liked it. Oh, another classic I haven’t seen. It sounds like a good one. Thanks so much! P.S. How do I get an autographed copy of your book? I would love that. Thus far I’ve ordered two lots of twenty from the publisher and it looks like it’s time to order the third. Not a bad thing at all. Yay!! I look forward to your email. Thanks, Rochelle. So that’s how you take 100 words and raise not just one but many many stories… good stuff, Amy. Keep er going! What’s with this Lloyd Brandy-Sipper? I wanna know. Thanks so much, Trent. This one could certainly go a million different directions, couldn’t it? Lloyd is the behind-the-scenes puppet master. I don’t think he’s super friendly either. Great little look into the lives of all the different types of people, with Lloyd lording it over everyone in his top flat. That was very cool but man, sometimes you forget how quickly 100 words can go by! There was a lot in there, I know. Why, thanks Jay! I’m glad you liked it. Great job, Amy, but what a miserable life! Indeed, it’s not very happy. Thanks, Janet. I don’t know what’s sadder, staring on a smartphone all the time, or stare at people in the building. This is a great story, full of the potential of many more stories. And yes, I got the rear window feel, too. Those phones keep us busy and just maybe take our minds off the more important things. Thanks so much. One glance is all it takes for some. I can’t help but wonder if this view is any more real a view than that we see of our neighbors on social media today. It’s a good question, Dawn. I think knowing that you’re being watched would make it really similar, because with social media you know you are on display. People love that or they don’t. It seems like the perfect stage for all kinds of mischief, doesn’t it? I know with social media there are people that are quite present and also many lurkers, too. Ooh, maybe I don’t want to think about that. 🙂 Thanks, Jan. Your story is the “perfect mix of joie de vivre and desperation.” All those people, all those lives, all that watching! Sheamus gave me shiver, but Lloyd totally freaked me out. Do you know what made this great instead of simply good? The names. They’re perfect. How’d you manage that? I just pulled them out of a hat, Mark. Ah, they just came to me and I guess I got lucky. What a nice compliment. Thank you! I enjoy observing people in public places. At the airport, I watch people walk by and wonder what their story is. Some of them make great characters for my stories, or something in the mannerisms or behavior catches my eye and sticks in the brain. You’ve created some fascinating characters here. I love people watching, Russell. It never gets old. Everyone has a story to tell. It’s great practice to watch and observe, and I suppose you never know what will stick and come out in a story. Thanks for your thoughtful comments. I’m so pleased you liked my characters. People watching is great! So many different people, each with something different to tell and do and see. Nice story! Thanks so much, Tiff. Here’s to happy people watching. Glad you liked my story. Thanks so much, Suzanne. Stories are all about the good and the bad. I’m glad you enjoyed it. Thanks, Adam. 🙂 There could be a different story for every line here.